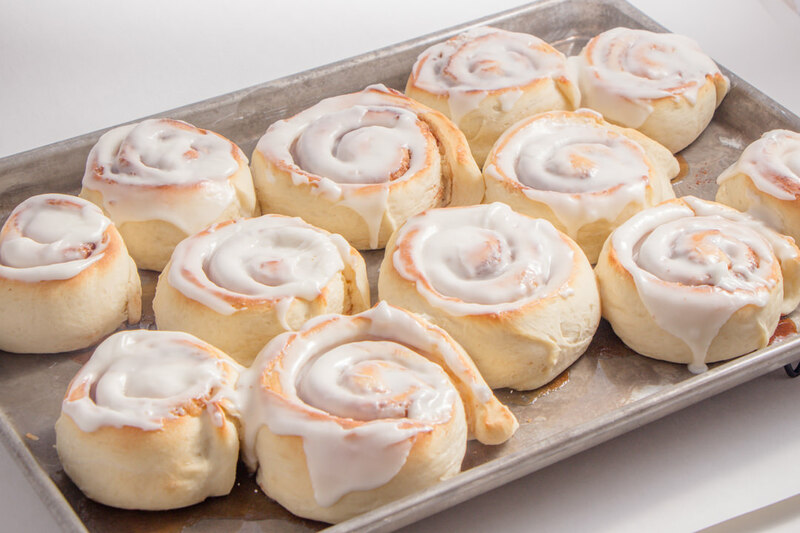 Making Cinnamon Rolls or Dinner Rolls doesn’t have to be difficult or even scary. Yes, Scary! Working with yeast is easier than you think. 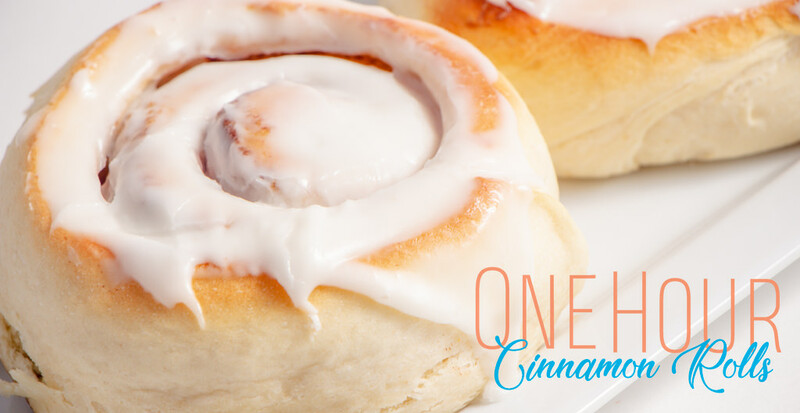 In this recipe, we make Cinnamon Rolls and Dinner Rolls in an hour and they are perfect, light and fluffy. Our Video Tutorial will take you step by step through each proceess to make these wonderful 1 hour Cinnamon Rolls. Trust me. It really is just that easy! I once felt that making rolls was hard. It was hard because I just didn’t understand how easy they really can be with the right recipe. These 1 hour Cinnamon Rolls take 1 hour and in the end you will have light and fluffy rolls to devour. I’ve made a step by step video tutorial just for those of you who need a little extra in the kitchen to help you along. I can’t wait to see what you whip up in your own kitchen. This recipe can also make dinner rolls too. Perfect to make both in just 1 hour. 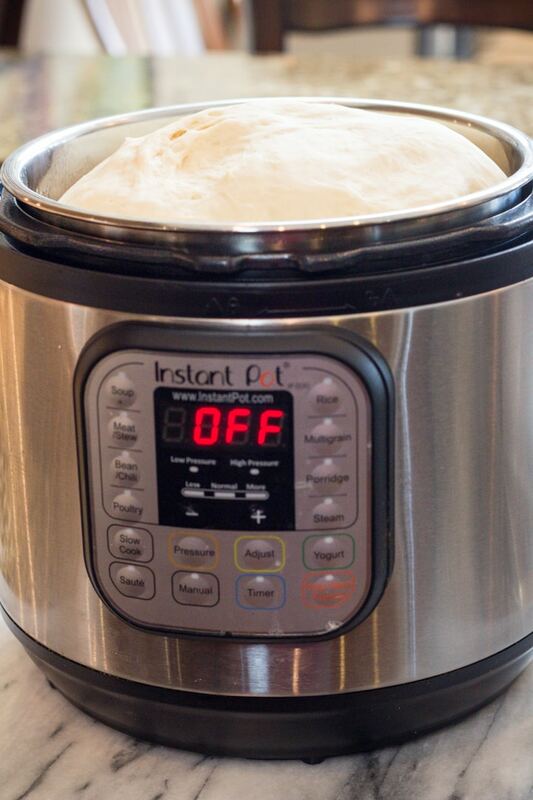 Proofing your dough is quick and easy in the Instant Pot. Set to the Yogurt button and allow dough to proof and rise. It cuts the time in half! In a large stand mixer, like a Bosch or Kitchen Aid, place 3 cups flour and salt, and add in your liquid. Keep miixer mixing through all steps. Add eggs one at a time. Add 3 more cups of flour and allow to mix. Add 3 more cups of flour one at a time and allow to incorporate and knead together. You now have 9 cups of flour into your recipe. Add an addition 1 – 1 1/2 cups flour. Check for stickiness. Dough should be pulling away from bowl edges. It should be sticky but not stick to your fingers. Remove dough and place in Instant Pot to proof. Set Instant Pot for Yogurt and place glass lid on top. rise for 15 minutes. Divide dough into 3 portions. Remove one portion and roll out iinto a square. Add brown Sugar, and Cinnamon and roll up. Using a knife slice into rolls about 3 fingers thick. 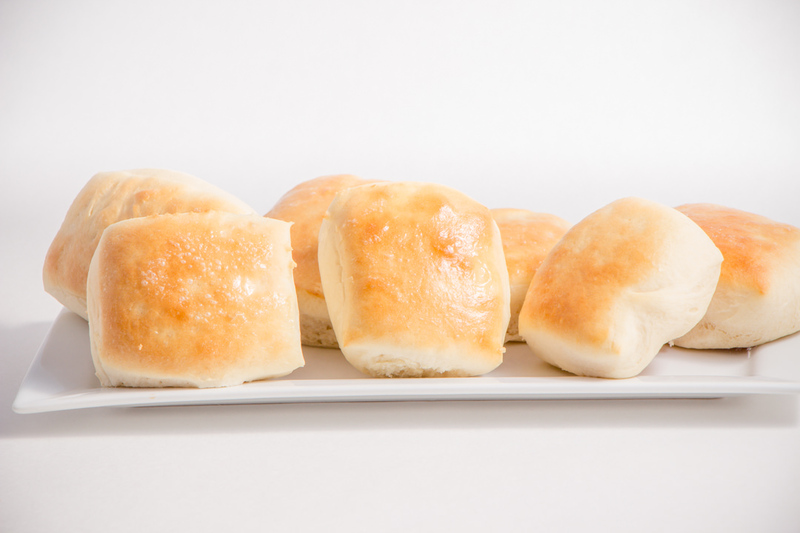 Place rolls on a greased cookie sheet. Bake at 400 for 10-12 minutes or until golden brown. 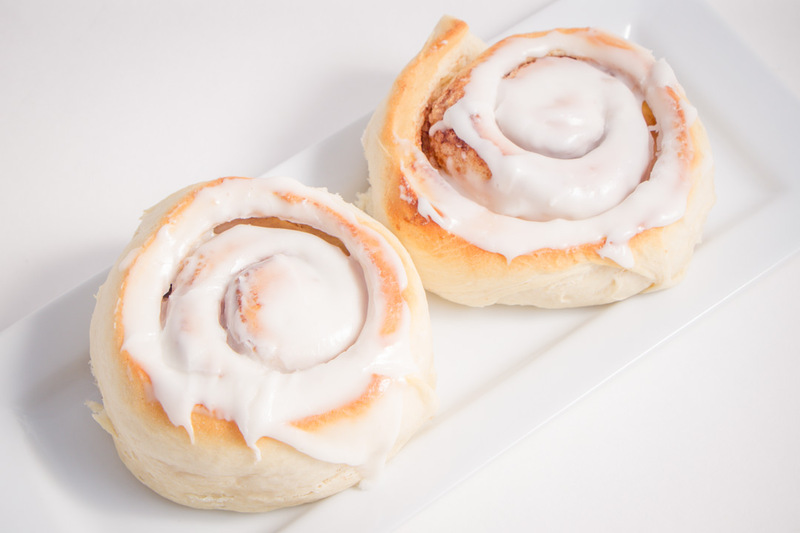 Cinnamon Rolls you can make in 1 hour. 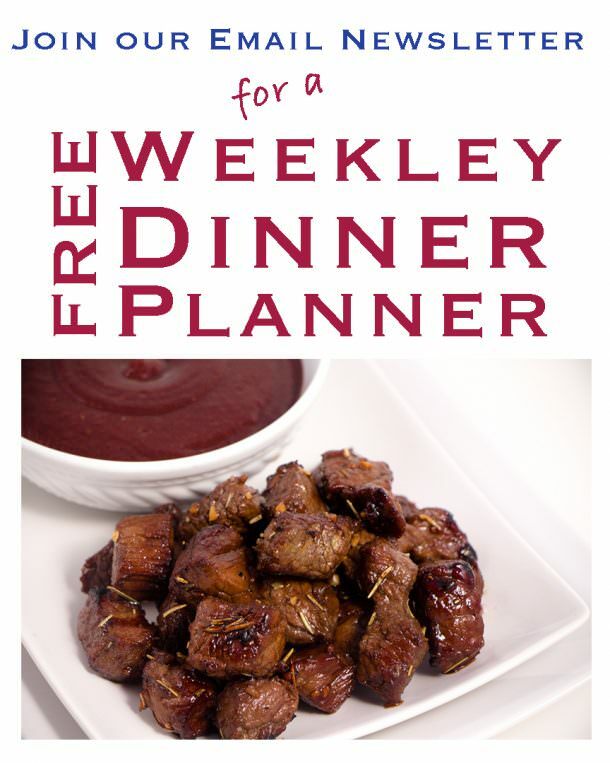 Easy recipe that is perfect every time. 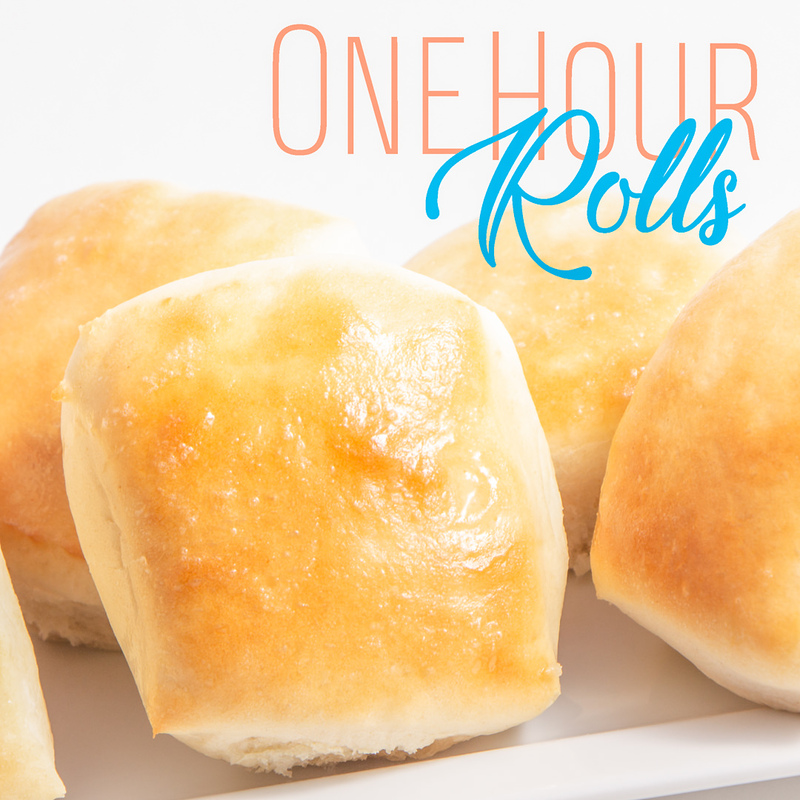 You will love this recipe for 1 Hour Rolls where you can also make Dinner Rolls or breadsticks too. In a Stand Mixer, add 3 cups flour and salt. Add Yeast liquid and mix. Add eggs one at a time and mix. Add the remaining 1 - 1 1/2 cups flour testing for stickiness. Dough should be sticky but not stick to your fingers. Remove from mixer and place Instant Pot on Yogurt Setting. Cover with a glass lid and allow to raise for 15 minutes. The yogurt setting is a perfect warm environment for the dough to raise quick and easily without killing the yeast. Roll out one section of dough into smaller rectangle about 1/2 in thick. Cut into squares and place on greased cookie sheet. Bake at 400 degrees for 10-12 minutes. 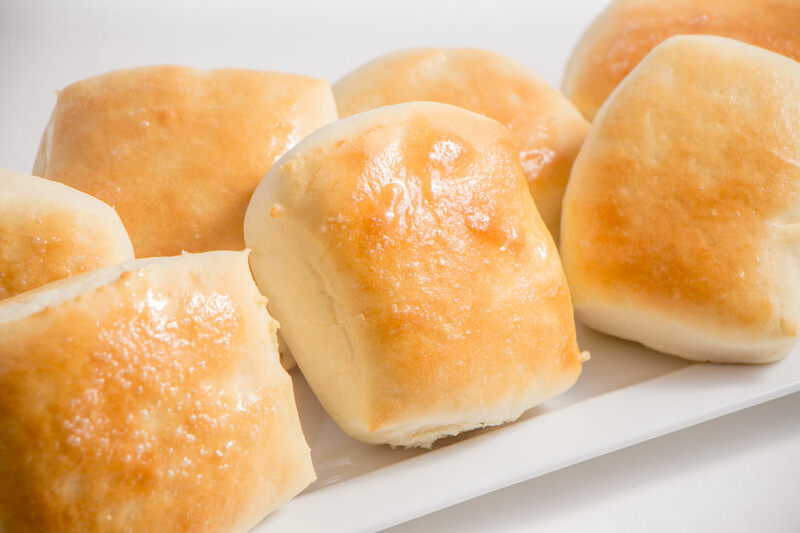 Brush butter on top of warm rolls. Serve and enjoy! Separate dough into 3 sections. Using one section at a time roll out into a rectangle. Add Brown Sugar and Cinnamon evenly over dough. Bake at 400 degrees for 10-12 minutes or until golden brown. Frost and Enjoy. Yum! 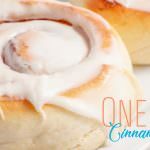 I love cinnamon rolls, espiecally ones that can be made on a whim weekend morning! Great post! Can’t wait to try them out! These look so incredibly easy to make and delicious! Yumm!! I’ll have to make these one day. I’ve been meaning to try it and this gives me some encouragement. Wow I always followed recipes that take way longer than an hour! I might make these for Father’s Day, my husband loves cinnamon buns! I absolutely love cinnamon rolls. I had no idea they were this simple to make, definitely trying this recipe.. Although I will probably have to make 2 batches as I don’t think they will last long in our house! Oh my gosh, I buy cinnamon rolls for my kids every week!! Saving to try!! Yummy! I love how quick and versatile this recipe is. These look so good! And I love that you can make dinner rolls and/or garlic breadsticks with the same dough recipe. I can’t wait to try this! It’s so great to make a little of everything! These sound delicious, and your pictures look great. A few suggestions: explain what “allow to proof” means for those who aren’t familiar; and I would clarify that the frosting and filling part of the recipe is only enough to complete 1 of the 3 portions of dough. Keep up the good work! 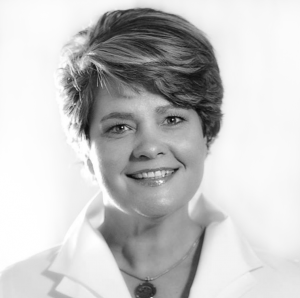 Hi Michele. Great Suggestions…I will add that in. 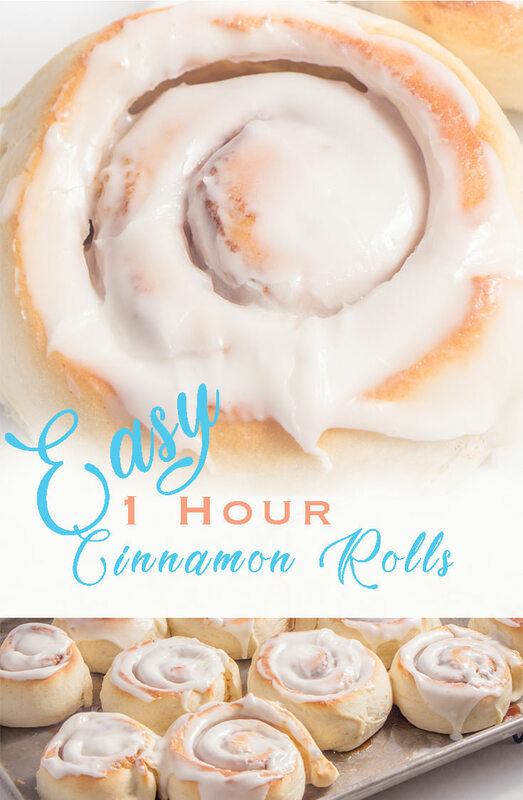 I have a Cinnabon CopyKat recipe that I use, but the downfall is they normally take about 4 hours from start to finish… This sounds like it would be a great alternative when you need a quick recipe! Hi Sydney… YES! This is a perfect option and these Cinnamon Rolls come up just like Cinnabon. So light and Fluffy! Delicious. So easy to make! My little one can help me make this bread, as she like making shapes for her own bread. That’s great. Getting kids in the kitchen and allowing them to learn and do is so great! These look delicious, seem simple and quick. I can’t wait to try them!